MP4 Converter Suite – a suite DVDs and video to MP4 conversion tool combined with DVD to MP4 Converter for Mac and MP4 Video Converter for Mac. 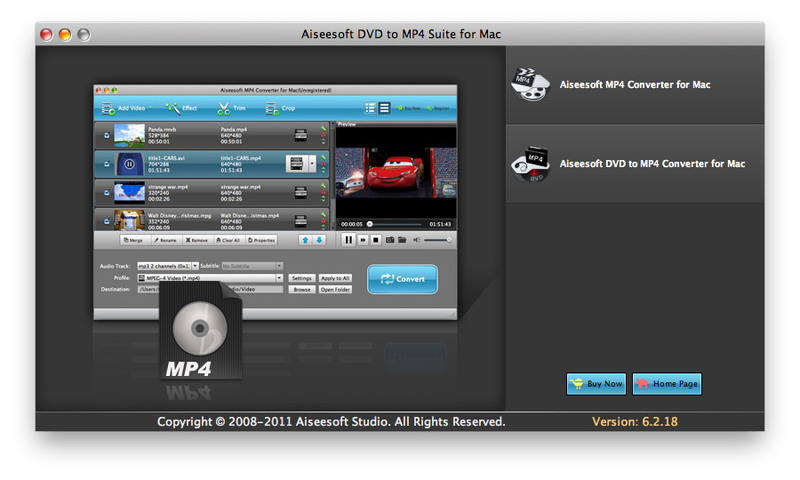 It is a discount suite to convert DVDs and video to MP4 video on Macs. It can convert DVDs and video to MP4 video files that can be played on iPhone, iPod, Apple TV and PSP with many practical functions including setting video brightness, contrast, saturation, selecting DVD subtitle and audio track, trimming DVDs and video, and merging selected files into one file and so forth. Rip DVDs and convert video to MP4 files supported by iPhone, iPod, Apple TV and PSP on Mac OS X. Trim your DVD and video to output your favorite DVDs and video clips only. MP4 Converter Suite for Mac is a very easy to use DVD to MP4 converter for Mac and Mac video to MP4 converter. To watch your DVD movies and videos on iPhone, iPod, Apple TV and PSP is just a few easy and intuitive steps. Why choose MP4 Converter Suite for Mac?